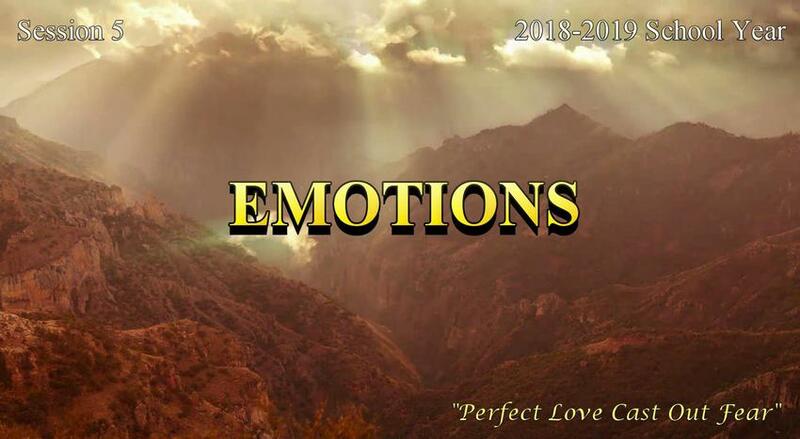 Objective of 2018-2019 School Year Session 5 "EMOTIONS"
To define, discuss, detail, and understand deadly emotions; to bring truth and freedom in the areas of controlling and dominating emotions by a changing of the mind with the truth and authority of the written and spoken word of God and the working of the Power of God’s Holy Spirit ultimately renewing the mind, resulting in changed behavior, attitude, and health towards one-self, others and above all God. Objective: To understand emotions defined, before the fall and God’s plan for it all. Objective: To discuss and understand the details of the temptation and fall of man through the account of Genesis 3 emphasizing the role, plan and lie of the serpent, the deliberate decision of both Adam and his wife and the first recorded emotion that caused man to be terrified.